Who doesn't love dessert? The Six Sisters have gathered together more than 100 of their best dessert recipes into one cookbook that the whole family will enjoy. From cakes and cupcakes and cookies to pies and brownies and ice cream, this cookbook has the easy-to-make, family-friendly recipes you've come to expect from the Six Sisters. Along with the sweet treats you can make at home are dozens of gift ideas and at-home craft projects that will help you make the most of your desserts. Learn how to make cake stands, start new traditions around birthdays and holidays, and prepare simple but memorable gifts for friends and neighbors. Full-color photographs of each recipe and craft bring every mouth-watering treat to life. A fun creative cookbook to use for all family members Loads of great recipes that will have all the friends and children especially asking to help cook and bake theses recipes with Mom! Enjoyed! I'm not eating desserts right now so it might seem a little strange that I jumped at the chance to review a dessert cookbook. I love Six Sisters' Stuff and use another cookbook of theirs all the time (especially when I need to take a treat to an activity) so I was excited to see what this book contained. This cookbook is absolutely perfect for someone like me. I enjoy baking more than cooking but I still don't like to take a lot of time. There are some more complex recipes in here but most of them are easy and don't take much time. They are filled with ingredients I've heard of and I have quite a few ingredients already on hand. I also love that they have pictures of every recipe so you get an idea of what it will look like, and that definitely makes more of them appealing. My daughter and I sat down and went through it page by page making a list of the recipes we wanted to bake. It was pretty long and with not too many days before my review, we were only able to get to a few of them. My daughter loves Red Velvet and they have a recipe for brownies and cake in here. The brownies were a hit! She also really liked the Cake Batter Blondies. She's got her eye on the Chocolate Raspberry Eclair Cake (pictured on the cover) but that one has to wait until I can try it, too. This book is packed with recipes for bars, brownies, cookies, cakes, cupcakes, cheesecake, ice cream cake, pies and no-bake treats. It will take us a while to work through the recipes that look good to us. In addition to the yummy recipes, they share ideas for movie night snacks (flavored popcorn! ), a neighborhood cookie walk, packaging treats and much more! This is a book I will be using for many years to come! I received a copy of this cookbook to review. My opinion is 100% my own. I have to admit, when I was given the opportunity to review this cookbook, it was a no-brainer, I mean, who doesn't like desserts, right? But I was a little worried, because most cookbooks I receive don't end up being something I use--either because they are too gourmet for my tastes, too complicated, or require things I never have around the house. This one is PERFECT! There's a variety of desserts--everything from cookies and brownies to pies and cheesecakes. They have fruity and chocolatey and everything in between. There are movie treats and desserts for formal soirees. Everything you could want. It will take me years to make everything in this book, but I can't wait to try! The recipes are easy and call for ingredients I surprisingly already have around the house. So far, what we've tried have been fabulous, and I'm looking forward to making more. As far as the book itself--the colors and photos are amazing. The layout is intuitive, and the directions are easy to follow. This book is a must-have for any kitchen. The six sisters of SixSistersStuff.com really know how to make delicious food. I love their recipe book A Year With Six Sisters' Stuff, and jumped at the chance to review their newest cookbook, Sweets & Treats with Six Sisters' Stuff. I'm a sucker for treats (which is totally catching up to me as I get older, but I digress), and this cookbook has some great recipes. Some of the recipes are more involved than others, and I appreciated that variety. Sometimes you have hours to bake, and other times you need something that you can throw together in 15 minutes. This is also a very visually appealing cookbook. Each recipe has a full-color picture of the finished product! It is so helpful to know what it should look like. I've tried several recipes so far, and my favorite is actually the very first recipe in the book. The Cake Mix Cookie Bars are so delicious (it's hard to go wrong with sweetened condensed milk), and they were very easy to make. I will definitely be making these again. I also made the Cheesecake Brownies. These were also fairly easy to put together, and my co-workers loved them. I was a little worried while they were baking that they didn't look anything like the picture, but once I cut them they looked right. And honestly, they were so yummy no one seemed to care what they looked like. The Oreo Cheesecake Bites were also a big hit at my home and office. They are very rich, so you could get quite a few "bites" out of the 9x13 pan. I've made two of the cookie recipes so far. The Butterscotch Chocolate Chip Pudding Cookies are the first pudding cookies I've ever made. I'm not a butterscotch fan, but my husband loves it, so I really made these with him in mind. The dough was very crummy, and although it seemed ok and tasted fine when I test cooked one cookie (that I'd smooshed together), I ended up adding more butter to make the dough easier to work with. I also made the White Chocolate Raspberry Cheesecake Cookies. Part of the draw to these was that they reminded me of my grandma. One of the ingredients is Jiffy Raspberry Muffin Mix, and my grandma always had Jiffy mixes at her house. I loved helping her in the kitchen, and it was often my job to mix up the muffins. The cookie dough requires chilling, so they aren't as quick of a cookie recipe as I prefer, but they are tasty. Mine tended to break when plated. I'm not sure if that's standard or if I cooked them a bit too long. Overall this is another great cookbook by Six Sisters Stuff. I'm excited to add it to my recipe collection, and my family and co-workers are anxious to taste test the next recipes I try. I tasted some of the Six Sisters recipes at friends houses and have been surprised at how good the food has turned out. When the opportunity came to review this book I was excited to try it. Scanning through the recipe book the first thing I noticed was how easy the recipes were. To me, there's nothing more frustrating than being excited to try a recipe and not knowing what half of the ingredients are or how to follow the instructions. Most of the ingredients I already had on hand and the directions were very straight forward and easy to follow. That made me even more excited to experiment. To be honest, we're not a sweets family. Not because we don't like them but because we like them too much so we try to stay away from them. The recipes we've tried have been incredible. Even my husband, who is quite particular about his food, has loved each one. I have my list of recipes that I will continue to try and serve to friends and family. This is a great recipe book for anyone who loves sweets and easy enough for a novice. I couldn't wait to get my hands on this book because of the picture on the bottom right of the cover, Chocolate Raspberry Eclair Cake! I have not tried it yet because I am afraid of what will happen if I do. It looks amazing and the recipe looks easy to follow. I have made the Nutella Brownies, Vanilla Sugar Cookies, and Mint Oreo Brownies. All three were easy to make and tasty. I couldn't get my topping to look as fluffy on the Mint Oreo Brownies as it looks in the picture, but it was delicious. I work as a lunch lady and so I had a couple of my co-workers try out a recipe or two. One made the Rocky Road Popcorn and brought it in to share. It was addicting. I am not a big fan of marshmallows, but I really liked the whole package together. Another made the Brown Sugar Bars. She said that it was an easy recipe to do, but it was a little too sweet for her taste. Her son loved it though. The pictures in the book are beautiful. The recipes are easy to follow and for the times when my sweet tooth needs a little attention, this is a great recipe book to go to. (4.5 Stars) For the last little while, I've been trying to eat healthier, but I just can't give up desserts. Whether I have them once a week or every day, my sweet tooth can't be curbed, so when a chance to review this book came up, I jumped on it! I've been following the Six Sisters' blog for a couple of years now and I love how their recipes are simple, yet satisfying. There are many comfort foods, as well as new recipes, and their desserts are some of my favorites. In the mood for cupcakes? This book has got you covered. Bars or brownies? It's got both of them, too. I love how most of the basic dessert categories are covered with a good variety of recipes. From bars, to cookies, to cakes, to ice cream, to cheesecakes, to candies/treats and more, this book is sure to have something to fit your mood or the season. I also loved how tips to share and show your treats are included. I decided to try a few different recipes and was pleased with the results. In fact, my husband wants to ban me from making treats for awhile because they're all oh-so-good. I tried the Nutella Brownies and the recipe was easy to follow. They turned out great and we couldn't get enough! I also made the Chocolate Marshmallow Cookies and they were a hit. The pictures for each recipe are well done and I also enjoy how each recipe gives a serving amount and a prep time, cook time, and total time. My 9-year-old daughter helped me make the Mini Pumpkin Pies and had so much fun with them. They're the perfect serving size for a person. She asked if she could help me make more recipes in this book and went through and found a bunch that she wants to try. There are many, many more that we're all looking forward to making, including the Slow Cooker Nut Clusters, Old Fashioned Vanilla Ice Cream, and Snickers Cupcakes, to name a few. This is a great book with a lot of possibilities. A great present for the cook in your life! f you haven't checked out SixSistersStuff.com you are missing out! I love the way that they do their recipes. They are always yummy, fairly simple and they use ingredients that most people have on hand. This book is awesome! I love the way it's organized into easy to find sections. Each recipe has a beautiful picture. They all look so yummy, I had a hard time deciding what to try first. I made their homemade Twix bars with our daughter. We had a great time making the recipe together! It had simple, easy to follow instructions. I also really like that this book has sections on things like a neighborhood cookie walk. What a great way to spend time with and get to know your neighbors better. 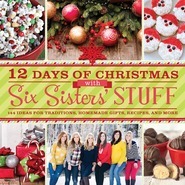 I highly recommend this and all of the Six Sisters other cookbooks, they are fabulous! And they would make an amazing Christmas present for the cook in your life!